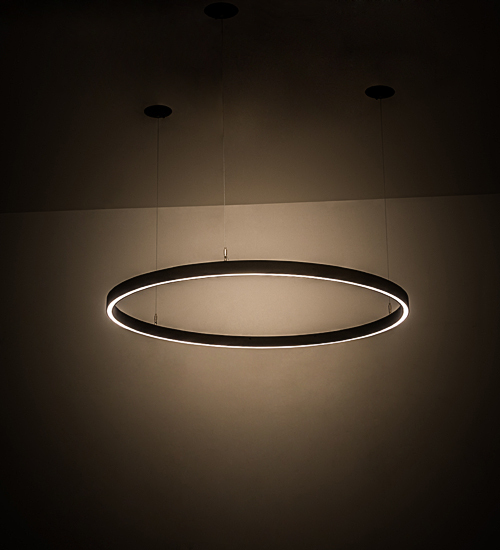 Description: A modern sophisticated pendant featuring a spectral halo of ambient light. Eliminating the power cord, our exclusive proprietary suspension system is engineered with low voltage spacecraft cables for balance, precision and a clean aesthetic. This Bronze finished ring reveals a Statuario Idalight diffuser. Integral LEDs deliver dimmable, robust illumination, energy savings, minimal maintenance and long life. The overall height ranges from 4 to 78 inches as the system can be easily adjusted in the field to accommodate your specific lighting application needs. Handcrafted in our 180,000 square foot manufacturing facility in Yorkville, New York. Available in a wide range of custom choices including various finishes and sizes.